Students who sat G.C.E. (Advanced Level) Examination can now apply undergraduate courses for undergraduate courses in the fourteen (14) universities, three (3) Campuses and the five (5) Institutes. You can now buy the University Grants Commission Handbook which describes the selection procedure for undergraduate courses with application from bookstores in Sri Lanka. Admission to undergraduate courses of the universities in Sri Lanka – Academic Year 2012 – 2013 – Based on GCE A/L Examination 2009″ here. The following UGC webpage gives information on Z-score details, how to determine your district for selection of courses, How to make an appeal, How can you request to change the selected course, mutual transfer details etc. 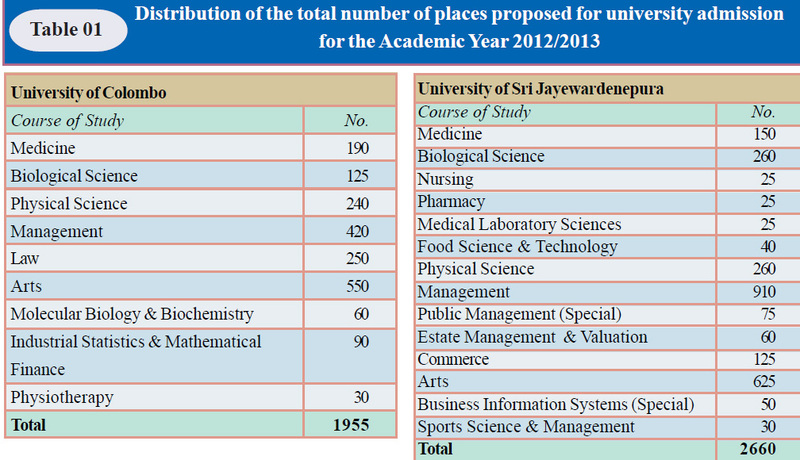 According to UGC book following places are available for students for the Academic Year 2012/2013.